All of our impregnation systems can be specified with our market leading Ultraseal Recycling Technology and Recycling sealants, giving you best-in-class sustainability with greatly reduced sealant consumption, water consumption and effluent waste. We also offer the option of a Hot Cure Water Recycling System to continuously recover and recycle the hot cure process water, ensuring a virtually zero effluent discharge impregnation process. All our recycling systems are designed to maintain process water cleanliness and process quality. Why choose a recycling impregnation system? In a standard impregnation process i.e. one using non-recycling sealant – more than 90% of the sealant is typically consumed and is therefore not recoverable for reuse. Instead, it is washed off the components in the cold wash module and must be treated as effluent. This adds cost to the impregnation process and increases environmental management costs for the user. Recycling sealant means that up to 95% of the sealant is recovered and ready for immediate reuse. 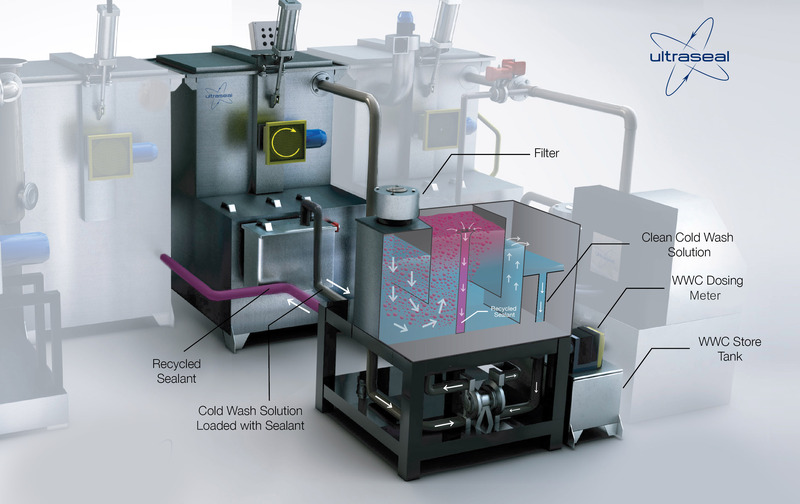 How does the Ultraseal Sealant Recycling System Work? Ultraseal’s Water Recycling System for the hot cure stage of the impregnation process allows the whole process to be virtually effluent-free. The Water Recycling System works by continuously pumping hot water from the hot cure tank to an energy efficient distillation unit where the water is purified before returning to the hot cure tank for re-use. Eliminates production down-time from process water change. *Only a small amount of concentrated waste is produced during the distillation process – less than 2% of the volume in the water tank (dependant on process parameters). During distillation, it is separated from the water and collected automatically for disposal.